Human beings relate with the world and with each other through the senses. If there is any other way to do so, I don’t know what that would be. Unimpaired, people can use all sensory systems. Typically each will have a sensory preference, although a nonpreferent system may predominate in specific situations. Sensory preference may be observed from birth or before in some (e.g., kinesthetic babies sucking a thumb or finger in utero). Very young kinesthetic children may be seen touching anything that is soft such as the satin border on a blanket and being especially sensitive to the feel of something against their skin and to odors or flavors. By pre-kindergarten age, sensory-preferent behaviors can be identified in most children. Those who are Visual may say: Look at me! Children who are Auditory may say: Listen to me! Youngsters who are Kinesthetic may say: Rub my back! And then there’s all the complex routing of sensory data to the correct decoding centers in the cerebrum (except for odors that are decoded in the limbic system) so the brain can make sense of it. By adulthood it is believed that most people exhibit a Sensory Preference. This term refers to the type of sensory data that registers most quickly and intensely in their brain. 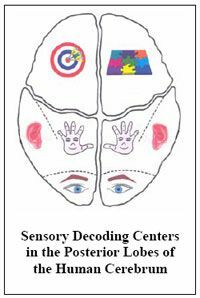 Sensory preference will impact at least the way they take in sensory data, their comfort level in any given situation, the way they learn new information most easily, and the way in which they interact with others and with the environment. In general, humans tend to feel affirmed and understood when they receive sensory data in their preferred sensory system. They may also use less energy in the decoding process. These Brain References deal with the brain and the sensory systems.